Our team is working on a new design for the Silverlight Community Site and one of those aspects includes a new media experience for the online media/video portions of the Silverlight, Windows Client, and ASP.NET sites. Today we rolled out the new experience first on the Windows Client community site. It’s a subtle update but hopefully a welcome one. 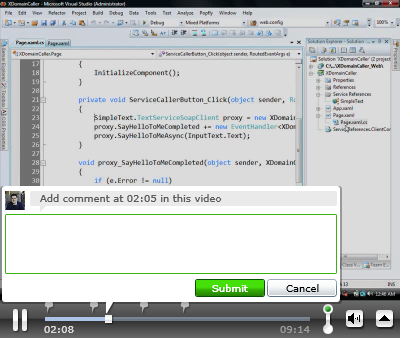 Commenting feature in the media – the viewer can now add a comment in the timeline. 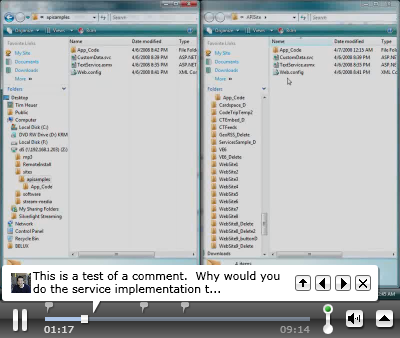 Sharing features – enabling emailing a link to the video from the player, also enabling embedding a video. As the timeline approaches a comment a small popup appears with the comment. Navigation allows you to cycle through the timeline-based comments. This feature can be turned off using the toggle to the right of the timeline. To add a comment, you can hover over the timeline position marker and create a comment at that point. Like I said, nothing earth shattering and yes, you’ve seen these features on other popular media sites before. We liked them and wanted to bring them to our sites. I just wanted to point out some of the newness to the site for Windows Client and what will be soon brought to the other online properties. Try it out and tell us what you think.